Two sequential firing incidents in Raikot and Rajguru Nagar has again raised question mark on the security scenario in the city and surrounding areas in the wake of Assembly elections. 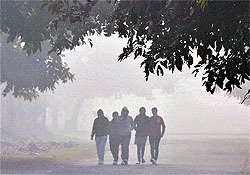 Residents today woke up to the beauties of the nature as many areas of the city were engulfed with dense fog, while some were free from it. Commuters were forced to drive in almost zero visibility. Online booking of LPG gas cylinders was introduced for the convenience of people, but it seems to have become a matter of inconvenience for the costumers. Long queues can be seen outside the gas agencies as they are facing difficulty in understanding the online booking procedures and workers at the agencies are guiding them. While residents were busy welcoming New Year by holding dance and dinner parties, a few in the city were serving others with smile throughout the night. 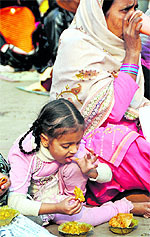 From milk vendors to police personnel, there were some who were busy doing their duties even on the eve of New Year. The Punjab and Haryana High Court, Chandigarh, has directed Deputy Commissioner, Ludhiana, Rahul Tewari, to prepare the list of riot victims, who are yet to get immovable property (houses, booths and flats) from the government. Ishwar Chander has replaced Dr SS Chauhan as the new Police Commissioner of the city. This step was taken following the orders of Election Commission to transfer Dr SS Chauhan. He was transferred following allegations that the top cop was helping the ruling collation. With the post of Youth Akali Dal (YAD)district president falling vacant following Simarjit Singh Bains’s expulsion from the party, different Akali leaders have started lobbying hard for this post. Simarjit Singh Bains, who was the YAD district president till Thursday, was considered close to YAD president and Deputy CM Sukhbir Singh Badal’s brother in-law Bikram Singh Majithia. 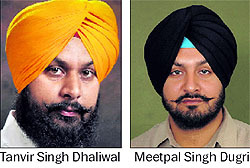 Cabinet minister Hira Singh Gabria had to face an embarrassing situation when Taranjit Singh Nimana, district president of the Shiromani Akali Dal’s dharam Parchar” wing, who was “honoured” and brought back to the party fold by Gabria yesterday, later addressed a press conference and said that he would support only Simarjit Singh Bains. Although Chief Election Commissioner of India has increased the cash-carrying limit from Rs 1 lakh to Rs 2.5 lakh, yet industrialists are unhappy with it. They strongly feel that the industrialists should not be brought under this clause. 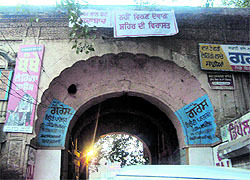 The controversy surrounding the 105-year-old Lala Devi Chand Inn took a new turn, with 11 members of the Virasat Bachao Action Committee declaring to approach the Punjab and Haryana High Court, Chandigarh, to seek cancellation of the registration of inn land. The New Year has no relevance for those who spend their nights shivering out in the cold or sleeping without having proper meals in the city. The sun rises in the same way, and night descends in the same manner yet with the change of date, New Year brings with it new hopes and dreams. With the dawn of New Year, almost everyone makes resolutions to achieve something, shed the old ways-the difference being that some people promise themselves tacitly, while others make a written agreement. Dr Karamvir Goyal was elected president of the IMA, Ludhiana. The election to the president’s post was held today at the IMA House. Total votes cast were 307. More than 50 volunteers of the National Service Scheme unit of Government Senior Secondary School, Kanganwal, carried out a cleanliness drive at the village and surrounding localities during the seven-day camp that concluded on the school campus yesterday. Tarun Malhotra overcame a stiff challenge from his immediate opponents to emerge as the overall winner in the Mr Libra Bodybuilding Competition organised at the Libra Health Club, Ferozepur road, here last evening.